Iowa Gov. Kim Reynolds said Friday that recent flooding in the state has caused an estimated $1.6 billion US in damage, pushing the total costs from the devastating Midwest flooding to at least $3 billion US. The ongoing flooding along the Missouri River has damaged thousands of homes and inundated vast swathes of agricultural land with water in Nebraska, Iowa and Missouri. The flooding, which followed heavy rains and snowmelt this month, has also been blamed for three deaths. 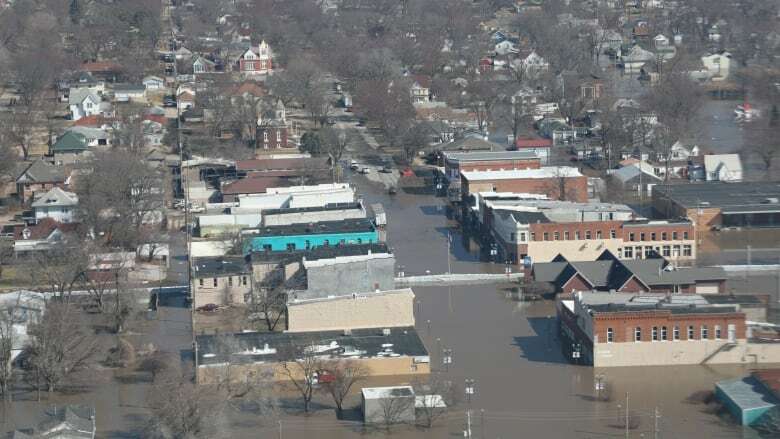 Reynolds said she sent a letter asking U.S. President Donald Trump to quickly issue a disaster declaration for 57 counties in Iowa where businesses, homes and levees have been severely impacted by flooding, including along the Missouri River. More counties may be added to the list. More than 1,200 homes in Iowa have been destroyed or extensively damaged, while another 23,540 have at least minor damage, she said. Cost estimates indicate the flooding has caused more than $480 million US in damage to homes, while businesses have suffered $300 million US in damage. Agriculture damage is estimated at $214 million US. Flooding in Nebraska has caused an estimated $1.4 billion in damage. The state received Trump's federal disaster assistance approval on Thursday. About 12.7 kilometres of levees in Iowa operated by the U.S. Army Corps of Engineers are damaged or destroyed, and the cost to repair them is estimated at $350 million US. About 281 kilometres of non-federal agriculture levees also need repair, at an additional cost of $175 million US. "We need to figure out a way to secure our communities and our farmland and start to repair the agricultural levees and focus on the Corps levees that have been compromised," said Reynolds. Missouri officials have not yet said how much flooding has likely the cost the state. The Missouri Department of Transportation said Friday that 120 roads were closed because of flooding, including stretches of Interstate 29 and U.S. 61. 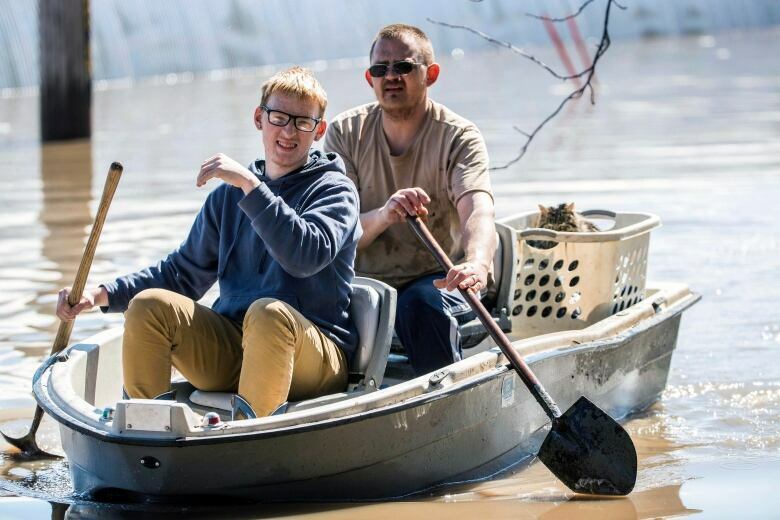 The National Weather Service said the Missouri River was expected to crest Friday at levels just short of those reached during historic 1993 flooding in Atchison, Kan., and St. Joseph, Mo. The Missouri River floodwater surging on an air base housing the U.S. military's Strategic Command overwhelmed round-the-clock sandbagging by airmen and others. They had to scramble to save or move sensitive equipment, munitions and dozens of aircraft. 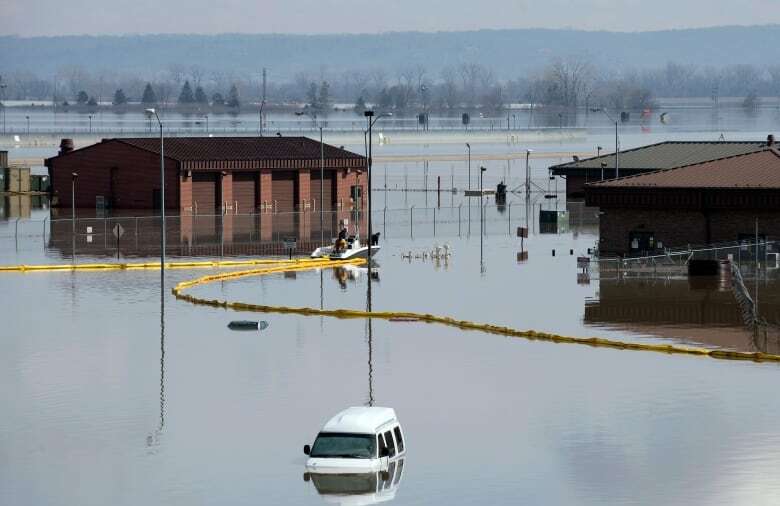 Days into the flooding, muddy water was still lapping at almost 80 flooded buildings at Nebraska's Offutt Air Force Base, some inundated by up two metres of water. The headquarters of Strategic Command, which plays a central role in detecting and striking at global threats, wasn't damaged, officials stressed. The floods were a reminder that the kind of weather extremes escalating with climate change aren't limited to the coasts, said retired Rear Adm. David W. Titley, founder of both the Navy's Task Force on Climate Change and the Center for Solutions to Weather and Climate Risk at Penn State University. "We probably do need some walls — but they're probably levees," Titley said, in a reference to Trump's proposal to take money from the military construction budget to fund a wall at the U.S.-Mexico border. "I would say those are the kinds of walls we need." It would takes weeks or more for scientists to determine if the flooding, or any weather disaster, was caused or worsened by climate change, which is occurring as emissions from coal, oil and gas alter the atmosphere. Under the Trump administration, unlike in previous administrations, the Pentagon has offered little public comment on climate change as a security threat. The Pentagon's guiding star of defence planning, known as the National Defence Strategy, does not even mention climate change. Titley predicted Offutt Air Force Base would prove the latest military installation to have racked up $1 billion US or more in damage. Hurricanes struck North Carolina's Camp Lejeune in September and Tyndall Air Force Base in Florida in October. The current political atmosphere discourages any big efforts building up base defences against climate change, said Titley, who also served as chief operating officer of the National Oceanic and Atmospheric Administration. The flooding comes during a week in which the NOAA released its spring weather outlook, in which they warned more than 200 million Americans are at risk for some kind of flooding, with 13 million of them at risk of major inundation. About 41 million people are at risk of moderate flooding. This year's flooding "could be worse than anything we've seen in recent years, even worse than the historic floods of 1993 and 2011 ," said Mary Erickson, deputy director of the National Weather Service.